All of our museum buildings are located in the beautiful picturesque countryside of Hunterdon County, New Jersey. Do you have a photo of our buildings or an event you’d like to share with us? We’d be thrilled to post them here! Email us for details. 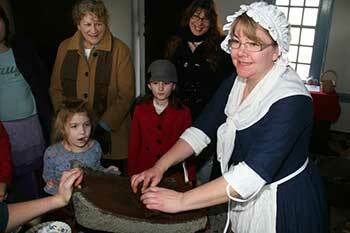 The Readington Museums' Program Director Kimberly Costa grinds roasted cocoa nibs into chocolate as Museum Assistant Margaret Smith removes hulls from the beans. 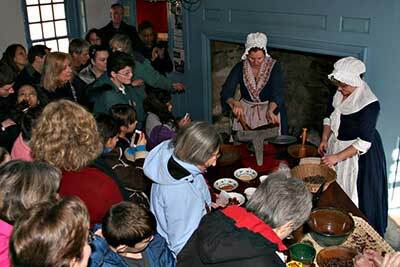 This 18th Century Chocolate program brought over 150 visitors to the Bouman-Stickney Farmstead on Sunday, February 3, 2013. 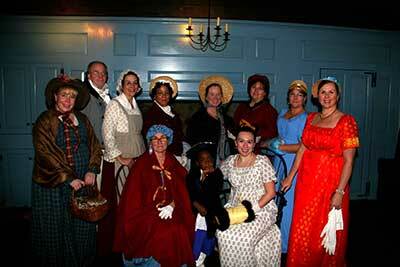 Members of the New York and Central New Jersey JASNA (Jane Austen Society of North America) showed off their finery at the Readington Museums’ Christmas with Jane Austen program.holiday treats. As part of the Christmas with Jane Austen program, visitors were invited to try their hand, or foot, as some simple country dances commonly enjoyed during Austen’s time. 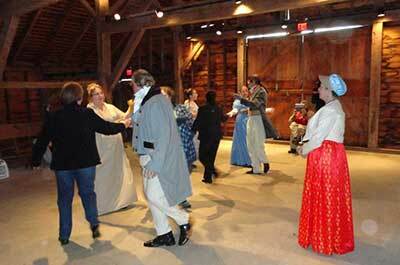 The dance was held inside the pre-Revolutionary Wade-Wyckoff barn, which is part of the Bouman-Stickney Farmstead. 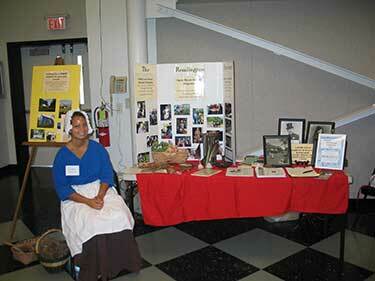 Summer intern Brittany Gajewski awaits visitors to the first Hunterdon History Expo, held Saturday, June 23rd at the Hunterdon County complex in Flemington NJ. Over 30 museums, entertainment and historical organizations were present to showcase their sites. 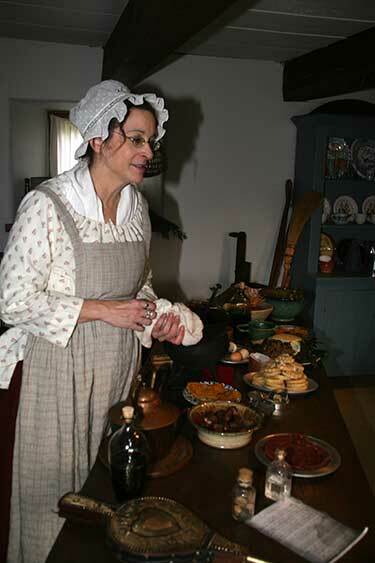 On Saturday, February 16h the Readington Museums held an Open Hearth Cooking class as part of their on-going hands-on history programs. 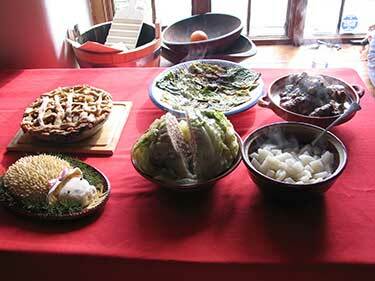 During the program eight participants learned about period receipts, prepared the food using the Museums’ open hearth, and then sat down to a sumptuous dinner. Foods from L to R and Back to Front: pear tart, fried leaves, beef olives, hedgehog, meatball cooked in a cabbage and sweet turnips. Not pictured were the fried cookies which were eaten as soon as they hit the plates. 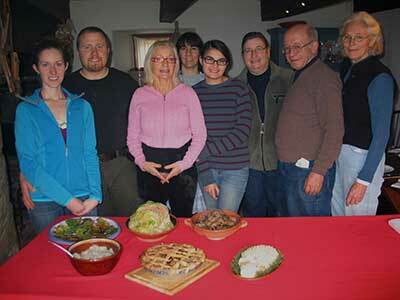 For more information about upcoming cooking classes please contact the Museums’ staff. Amber and Floyd Campbell, Elizabeth Farrant, Ann Marie Anderson, Tara Mahrjan, Ellen Linderman, Tony Weber and Lynn Burtis.